3D Mardi Gras Throw Me Something Mister! 1.0 is screen savers: other software developed by San Diegp Screen Savers. Set against a variety of Mardi Gras themed background images (user's choice) makes this the perfect screen saver for celebrating Fat Tuesday. Demo contains full set of features. Music is a jazzy brass sound, setting the party-hearty mood. Have fun customizing this screen saver to your preferences. In addition to tint, brightness, time of day settings, sound mute and volume control you can play your own mp3 music. This desktop software is shareware, which means you can download and use 3D Mardi Gras Throw Me Something Mister! 1.0 for free during the trial period (usually for 30 days). At the expiration of the period you will have to buy the screen savers: other product for $9.95. 3D Mardi Gras Throw Me Something Mister! 1.0 is available at regnow and San Diegp Screen Savers website. 3D Mardi Gras Throw Me Something Mister! 1.0 supports English interface languages and works with Windows 98/XP/Vista. Latest 3D Mardi Gras Throw Me Something Mister! 1.0 does not contain any spyware and/or advertise modules, allowing installing it with no worries concerning valuable information loss. 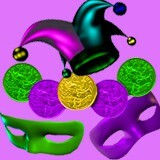 We has completely tested screen savers: other software 3D Mardi Gras Throw Me Something Mister! 1.0 many times, written and published the interesting article and uploaded installation file (3908K) to our fast server. Downloading 3D Mardi Gras Throw Me Something Mister! 1.0 will take minute if you use fast ADSL connection. 3D Mardi Gras features combinations of 3D Mardi Gras trinkets including beads, coins, hats, masks, musical instruments and more. 3D Mardi Gras Teddy Bears features 6 teddy bears dancing or playing music.